Representing power usage in the sky!! 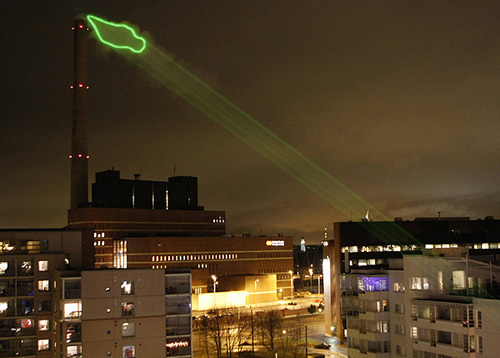 An interesting project by a power plant in Helsinki displayed the power consumption by local residents mapped on to a green cloud and projected into the sky (onto the fumes emitted by the power plant!!). This was done for one week. This is an amazing idea (of monitoring the collective usage of electricity in an area) to raise public awareness for such an important issue. As mentioned in the blog for the event “The cheapest and most environmentally friendly energy, is energy that is not consumed“.